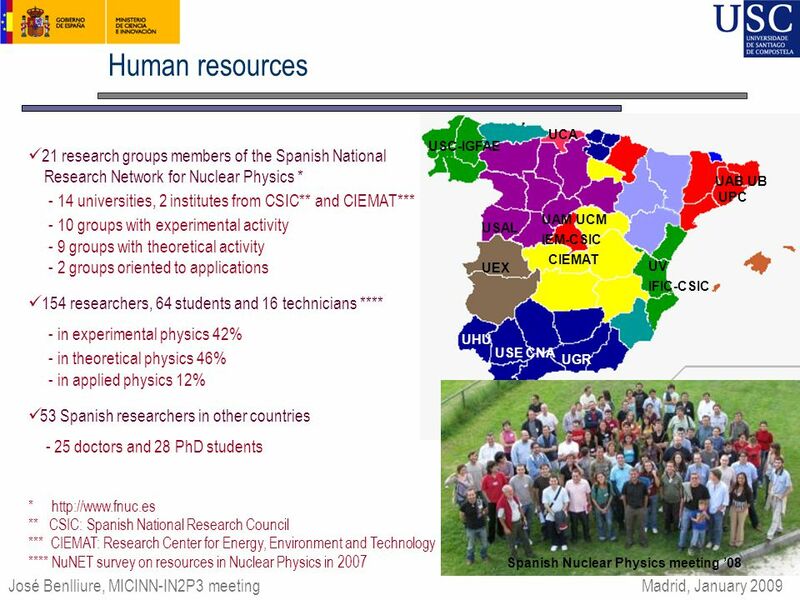 Nuclear Physics research in Spain José Benlliure Universidad of Santiago de Compostela Ministerio de Ciencia e Innovación Present: Human resources, infrastructures. 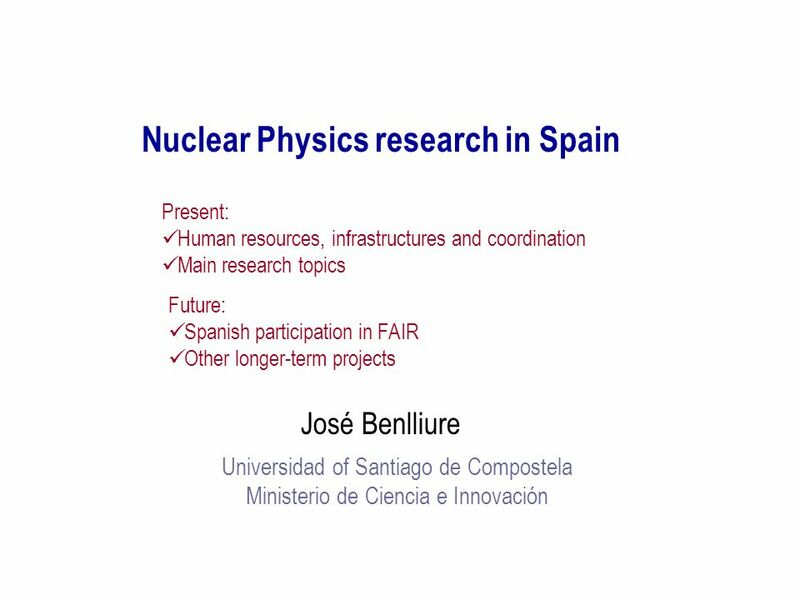 Download ppt "Nuclear Physics research in Spain José Benlliure Universidad of Santiago de Compostela Ministerio de Ciencia e Innovación Present: Human resources, infrastructures." 1 NuPECC/ERA-NET, Paris; 27 May 2005 NuPECC LRP & Nuclear Physics ERA-NET Muhsin N. Harakeh NuPECC & KVI. 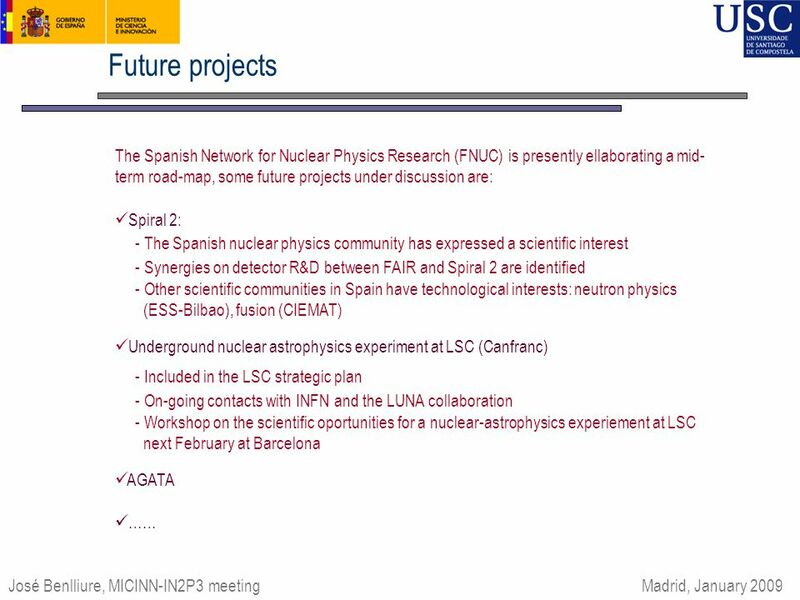 Recent achievements and future challenges of the Spanish research in experimental Nuclear Physics José Benlliure Universidad of Santiago de Compostela. 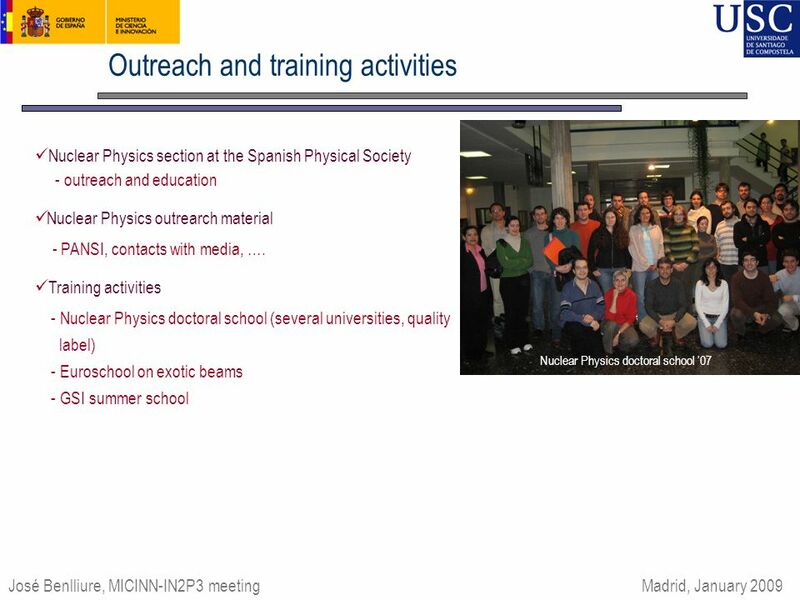 Nuclear Physics in Spain: Applications J.L. Tain Instituto de Física Corpuscular C.S.I.C - Univ. Valencia. 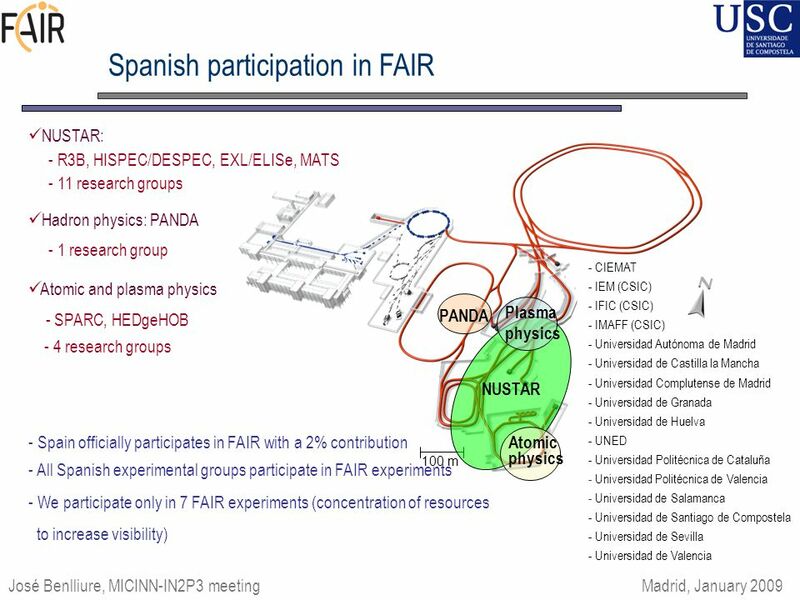 ERA-NET Cooperation and coordination of national research and innovation activities Last call 2005 Deadline September-October. Perspectives of Croatian experimental nuclear physics Neven Soić Division of experimental physics Ruđer Bošković Institute NuPECC meeting 13. Jun 2008. 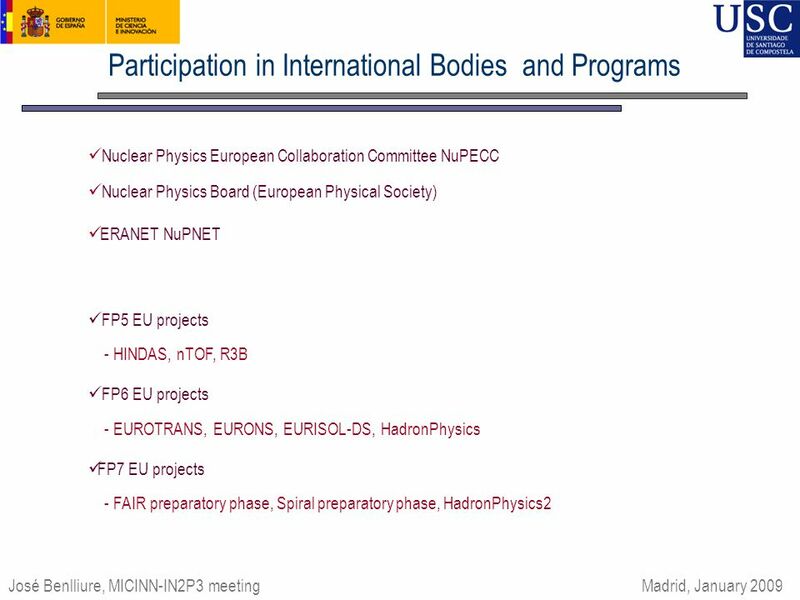 NuPECC Long Range Plan 2010 Perspectives for Nuclear Physics Research in Europe Guenther RosnerNuPECC Meeting, Bergen, 11/6/101. John Womersley The Science and Technology Facilities Council and Nuclear Physics John Womersley Director, Science Programmes October 2008. 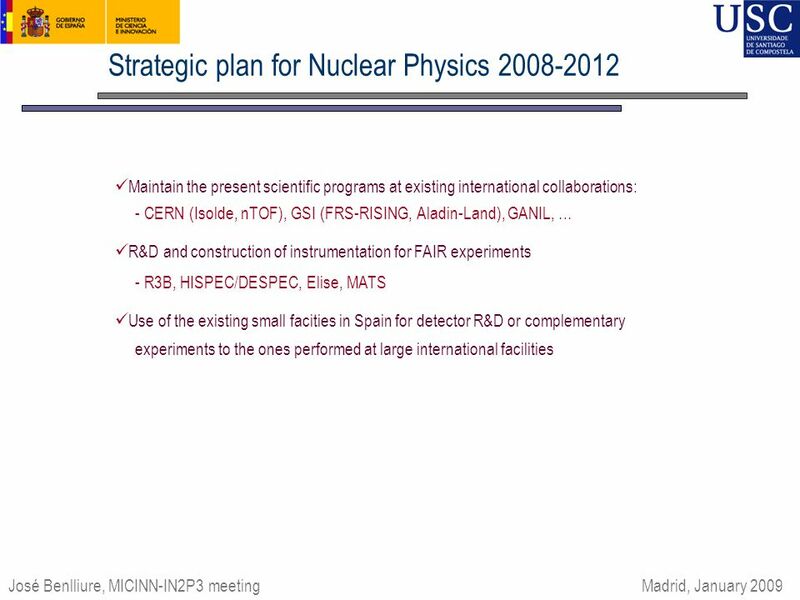 NuPECC Long Range Plan 2010 Perspectives for Nuclear Physics Research in Europe Guenther Rosner NuPECC LRP2010 Town Meeting Madrid, 2/6/10 1. 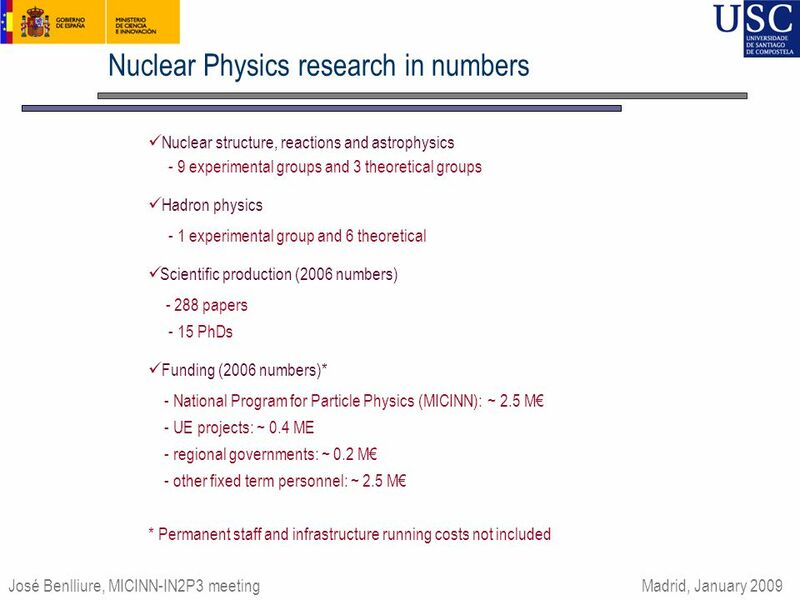 NuPECC: Towards a New Long Range Plan for Nuclear Physics in Europe Guenther RosnerEuNPC Bochum 18/3/20091. 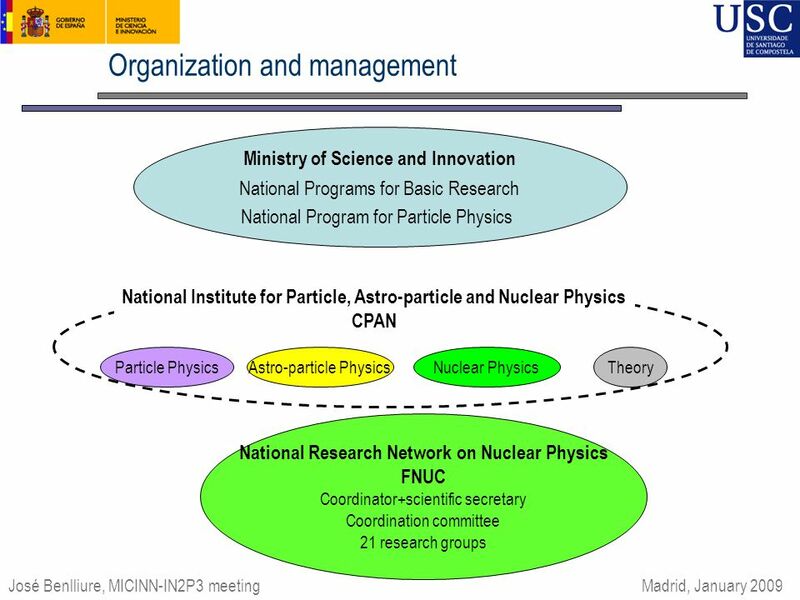 The Physics of Nuclei, Nuclear Matter and Nucleosynthesis Report of the Nuclear Physics Advisory Panel. 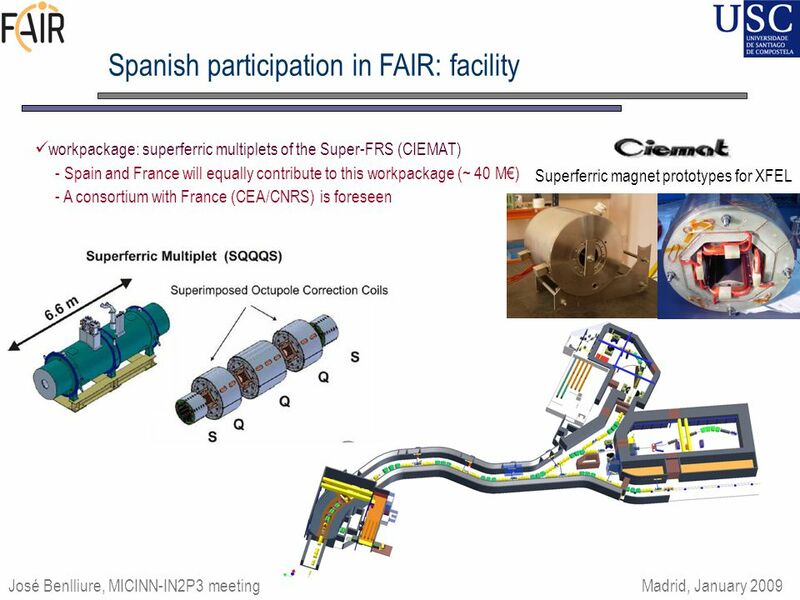 International Accelerator Facility for Beams of Ions and Antiprotons at Darmstadt Preparation of FAIR EU FP7 preparatory phase proposals J. Eschke, FAIR. 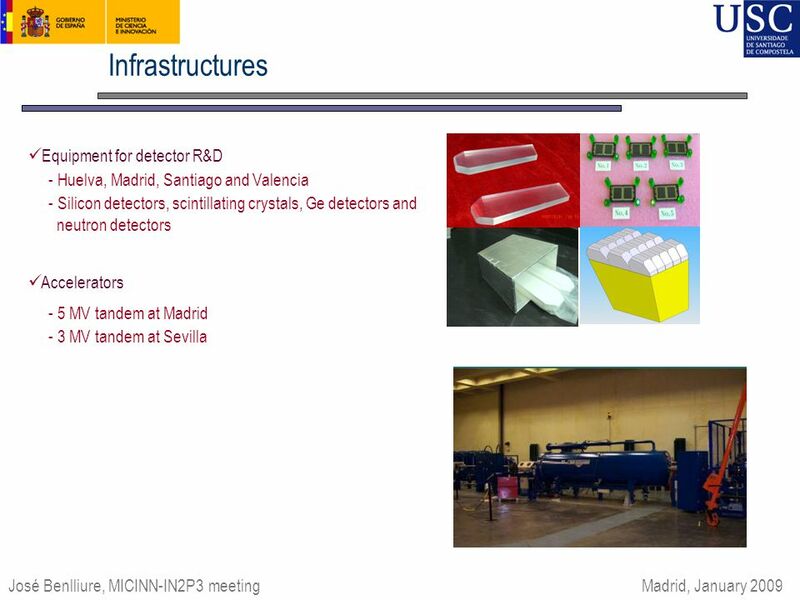 Presented by: Ángel Muñoz-Martin Meeting of the CRP “Development of a Reference database for Particle Induced Gamma ray Emission (PIGE) Spectroscopy” Vienna. 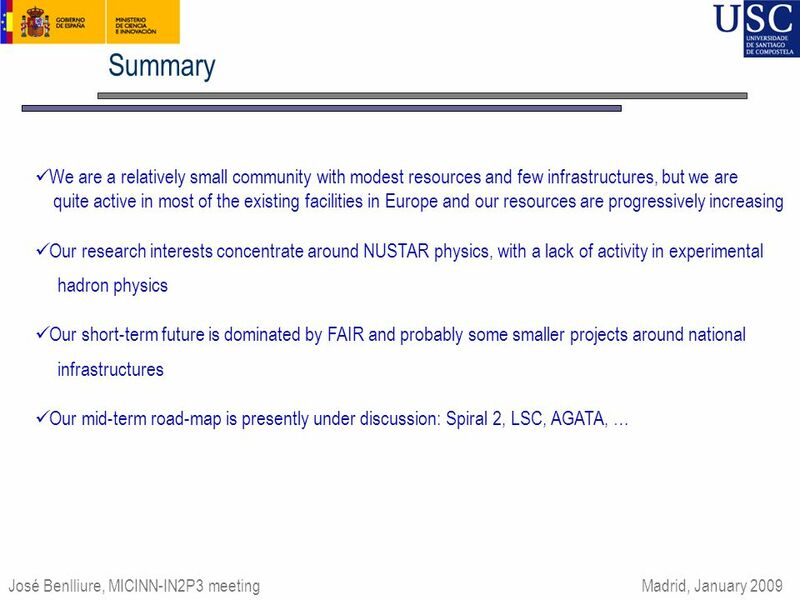 TIARA, Kickoff Meeting, 02/23/ February 23 and 24 CERN. Knowledge Transfer Office CPAN KT-CPAN Cristina Merino-Fernández December 2010. 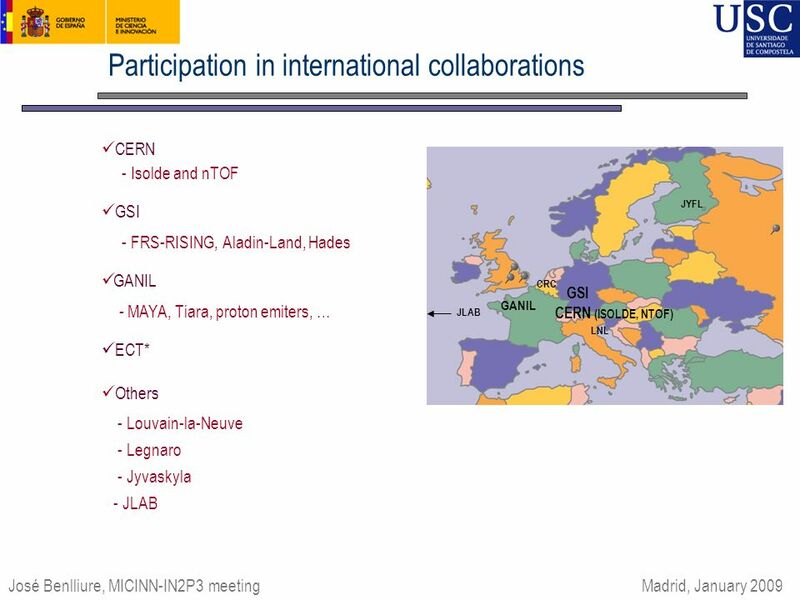 N Network for Active Targets 12 institutions (France, Spain, UK, Germany, Poland) GANIL, France CENBG Bordeaux, France SPhN/DAPNIA/DSM Saclay, France IPN. 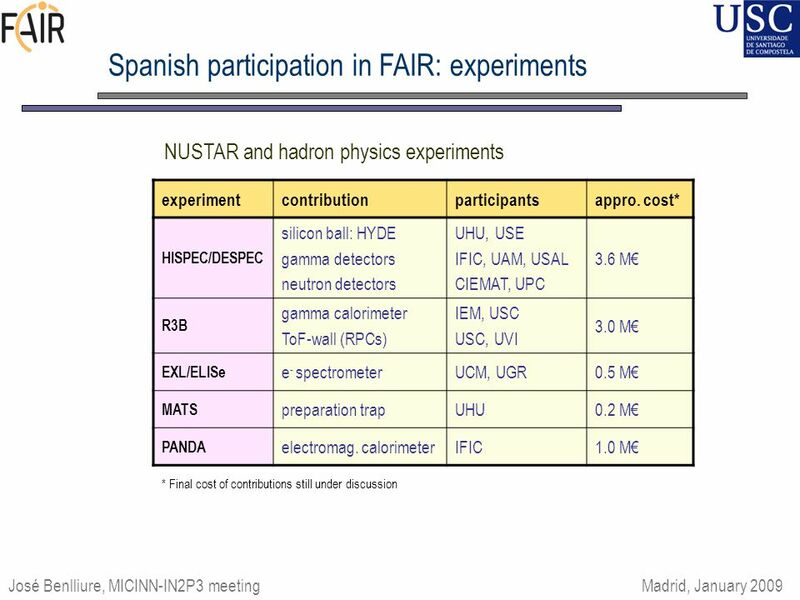 NATIONAL CENTER FOR PARTICLE, ASTROPARTICLE AND NUCLEAR PHYSICS IFIC UPC UZ UPV UGR UMU US CNA UH UIB USAL IGFAE UO IFCA ICE URL IFAE UB IMB IMAFF IEM. FINUPHY Instrumentation for radioactive nuclear beam facilities Rauno Julin FINUPHY Madeira, February 9, 2005.